You have made a commitment to yourself that this year you will create content for your website to provide value to and to attract more customers. But you already know that just creating the content doesn’t mean they will see it. That means that you also need to come up with ways to expand reach from social media to all that content. Today, we will discuss ways you can use Social Media to get eyeballs on new content, get more exposure, and in turn get links to your site. The first thing you need to consider is that not all social media is the same. Before you start sharing your content willy-nilly, you need to conduct a deep dive into who your customers are in order to figure out what “neighborhood” – that is which social networks – they frequent most. For example, if your customers are brides, you will probably get the most return on investment from time spent on Pinterest, Instagram, and Facebook. Makes sense, right? Once you have done that, take a few minutes to read through this post. We’ve dedicated a section to each of the major social networks so you can devise a social media strategy, come up with a social media content distribution calendar, and get that all scheduled out on a social media tool so you can set it and forget it. Let’s get to it! Within these posts, vary the types of Facebook updates. For example, your first post might be a link post, but your second and third updates might be image posts or video posts, if applicable. This helps you appeal to different audience members, as well as generate data on what types of Facebook posts engage your audience best. Each time you post, use different copy and preview images. The different link preview elements on Facebook are editable from the image to the headline to the description. Mix and match to test out different scenarios. Create a video to accompany your content and upload this manually (do not schedule it on a platform) to get the most reach from the video. To occasionally amp up your visibility, ask your team members and friends to share your business page updates to their personal accounts. Then, ask them to comment and to have conversations with each other on the posts. This helps broaden your reach and get your updates in front of people who aren’t already following the company Facebook page. Share the content three or four times on Twitter on the first day – make sure to vary the post write up and images. Don’t schedule your “first 24 hours” messages back to back. Instead, break them up with additional updates or retweet content from others. Use different copy, hashtags, and mentions in each update. Don’t just repeat the same message. Change it to see what engages your Twitter followers most. It is okay to retweet other people who share your posts, but don’t just leave it at that. Take these opportunities to try to get a conversation going. Also, be aware that you don’t completely fill up your feed with retweets and replies. Although you have the flexibility to post more Twitter updates, you still want to adjust the tweet frequency, so it’s in line with the average number of tweets you send in a typical day. For example, if you average around 10 tweets a day, peppering your stream with three or four messages about a new piece of content won’t overwhelm your followers. However, if you only average a few tweets a day, scale back this frequency. That way, your feed doesn’t become too self-promotional. First 24 hours: Pin/share all blog post images to Pinterest or Instagram. When you publish a blog post, share the visual elements to a relevant pinboard on Pinterest or in your Instagram feed after the post goes live. This will help drive viral interest in your content. 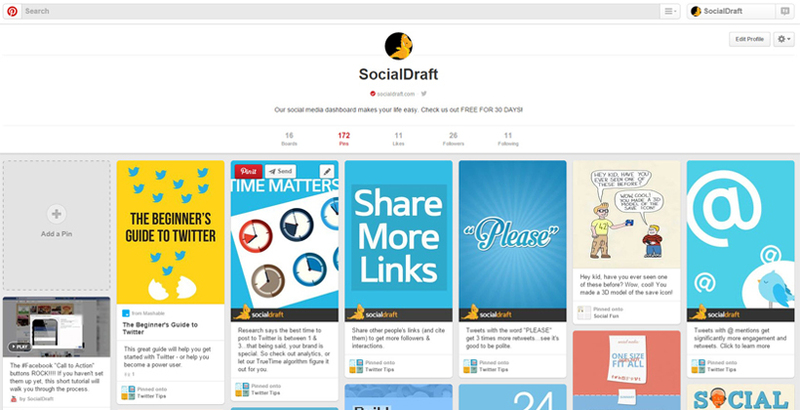 Schedule weekly/monthly recurring posts on Socialdraft. Post to Pinterest if your audience tends to be female, middle-aged, or older. Post to Instagram if your audience is younger. Keep an eye on your traffic referral and engagement rates to see if these general trends hold true for your followers. Use hashtags on Instagram and comment on similar posts. Post a number of notable images from a behind-the-scenes, how-to or regular article with your audience. Other options: Turn inspirational quotes from the article into images or share content in other formats to Pinterest and Instagram. First 24 hours: Post content link to a profile or long-form blog post. LinkedIn offers the opportunity to share either short updates in the form of links to content (that you can also tweet) or long-form blog posts in their entirety through LinkedIn Publisher. Decide how to post on LinkedIn on a case-by-case basis and determine who will post it. Rotating posting duties among senior staff members help keep things fresh for your readers and lets you reach a wider audience. When appropriate, post to your company page or in relevant LinkedIn groups. As you can see, this is a lot of work. Socialdraft is a social media scheduling tool you can use to schedule social media posts ahead of time so you can work smart and maximize the reach of your content. What exactly can you do with Socialdraft? If you’re curious about how Socialdraft works, take us for a risk-free trial. We look forward to having you become a part of the Socialdraft community.